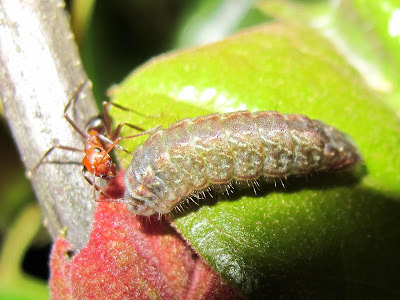 I went out Memorial Day evening to witness the Edwards’ Hairstreak butterfly larvae exiting their daytime underground shelter and climbing the tree for a night of oak leaf consumption. This is a behavior exhibited by only the more developed larvae and it is an event that I have always managed to miss. I think I nearly missed it again this year. I did see some larvae, but several trees that showed signs of heavy feeding were free of larvae. 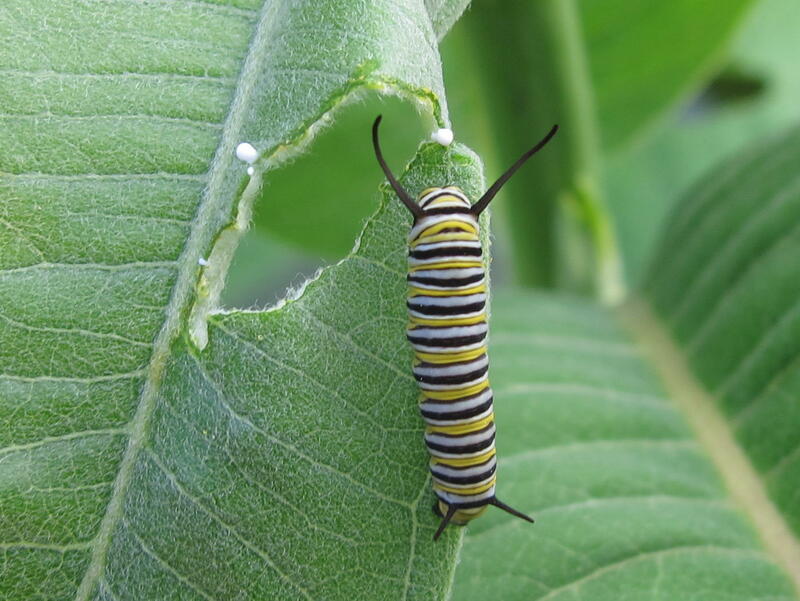 Adult butterflies begin emerging in early June, so it’s likely that many of the larvae have already pupated. I arrived at my target tree at 8:45, just as a Whip-poor-will began its song. After checking the tree and finding no larva movement, I set up my lawn chair and got ready for a wait. Despite a temperature of 84 degrees, I put on my jacket and hood to keep off the swarm of mosquitoes. 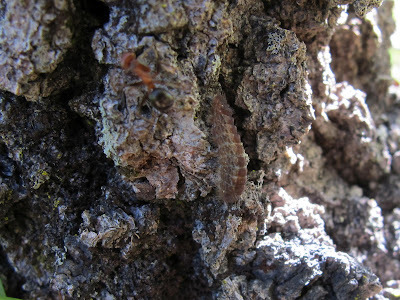 At 8:48 I again checked the base of the tree and witnessed the emergence of the first larva. I guess I did a pretty good job of guessing when activity would start. At 9:03 a Chuck-will’s-widow began calling in the valley below the ant ridge. A four battery Mag-Lite was my source of light, but the camera flash illuminated all of my photos. The flash light beam caused the larva to stop its progress and seek cover, so I used it as sparingly as possible. As the larva began its journey up the tree, there was still enough natural light to find my subject through the view finder. The larva had to endure only random flashes which I thought wouldn’t be too much different from what would be experienced as a result of an electrical storm. For serious behavioral observations I’ll have to have a light that doesn’t change the larva’s behavior. 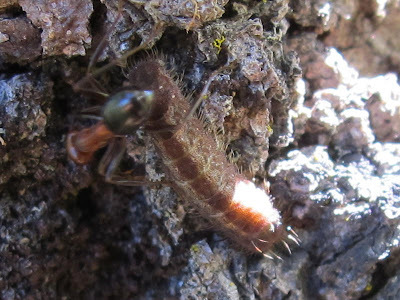 The larva spent about six minutes traveling three feet up to its feeding position. While the larva was traveling, the Chuck-will’s-widow moved into a cluster of small trees about 50 feet from my position. After about a minute of making its typical call, it began producing a low rhythmic call that sounded like a soft Bong-Bong-Bong note produced through a Didgeridoo accompanied by the sound of clapping wings. Chucks have just become common in this area during the last few years and I thoroughly enjoyed this opportunity to experience this aspect of its courtship display. 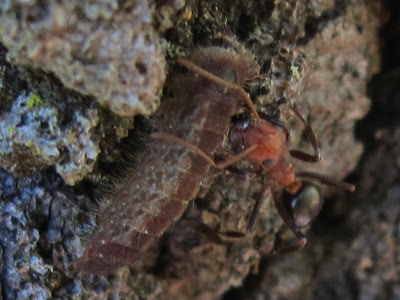 There was always one ant with the larva. This one is receiving its motivation for attending the larva, a taste of honeydew. I’ve read several accounts that describe the ants herding or driving the larvae as they journey up and down the tree. I never witnessed any indication that the ants had any control over the actions of the larvae. 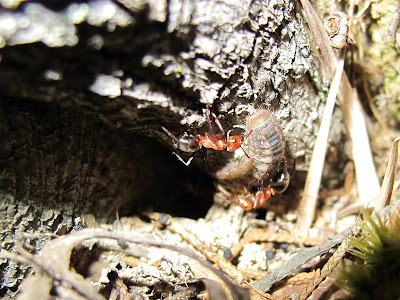 The ants remained in the company of the larvae, but the larvae seemed to control their own actions. The ant behavior reminded me more of children following after the ice cream truck. 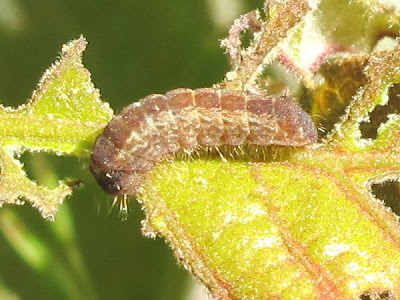 Once on the leaf, the larva ate continuously. The mouth was never visible from above and except for subtle shifts in position, no movement could be observed. I headed back to the house after a couple hours of observation. I was really happy to finally see this phase of the Edwards’ Hairstreak life cycle. If I can manage to witness adults depositing eggs on the oak, I’ll have captured the entire life cycle. Maybe I can manage that next month. 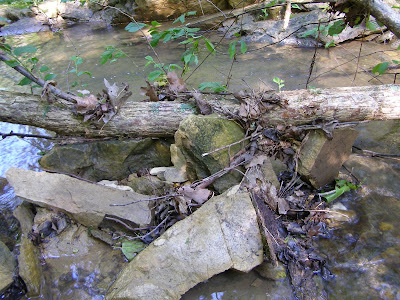 The record flood we had during the winter created several new obstructions in the creek. 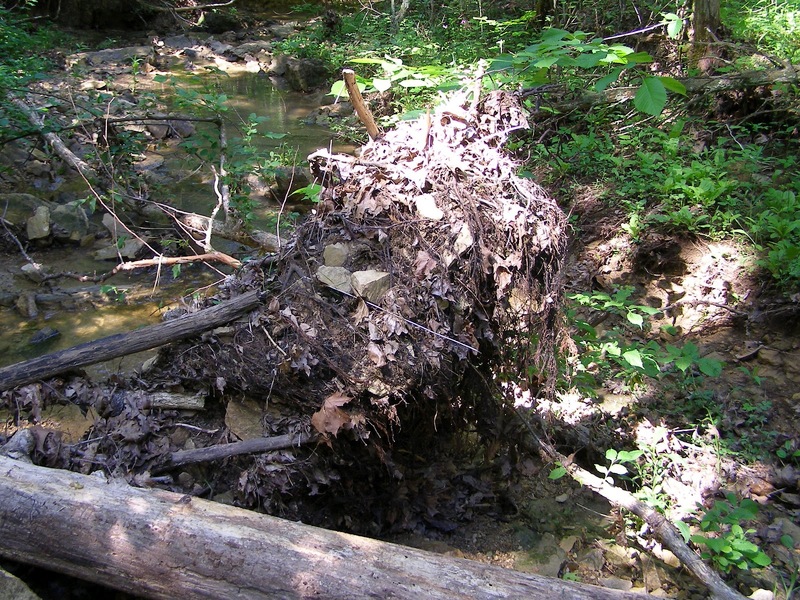 A typical obstruction is composed of dead tree parts. There may be anything from a full log to a bunch of dead leaves. The material decomposes over time and the mass looses its integrity. Eventually, another flood deconstructs the obstruction and carries it on down stream. Occasionally there’s a different type of situation and the inevitability of the outcome is not quite so certain. The key piece in this blockage is a still living tree. The root ball that once perched on a slab of bedrock just above the bank, slipped off of the rock as a unified mass and landed in the center of the creek channel. 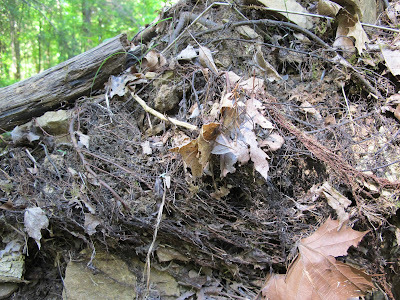 The bulk of the root system is still enclosed within the original block of soil. 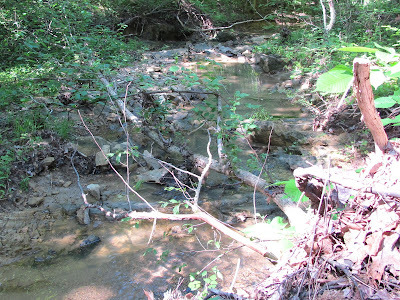 The soil is able to wick up enough water from the creek to keep the roots healthy and the tree hydrated. Eventually, the combination of rain and flood water will wash the soil from the roots. When that occurs, the roots will dry out and die. There are too many variable involved to predict just when that might happen. In the mean time, the tree is growing. There are several healthy shoots developing from the base. The tree roots that are in contact with the stream bed will most likely have the greatest longevity. 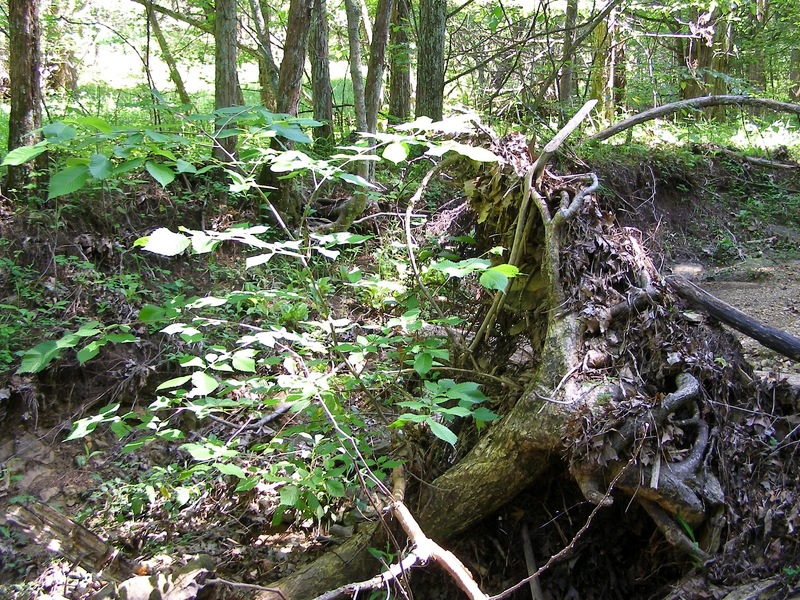 Basal sprouts tend to have the greatest chance of surviving on a fallen tree. Conditions may be right to give these sprouts many years of growth. At the moment the entire tree is producing healthy growth. 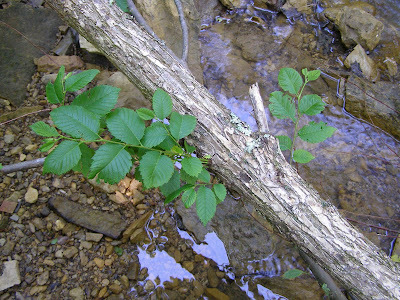 Production of new growth increases the ability of the tree to snag and retain debris floating in the current. The growing tree becomes responsible for a growing obstruction. Instead of losing stability as a result of decomposition, the tree and its collection of debris becomes more firmly positioned in the creek channel. This could result in a drastic and long term change in the nature of this section of creek. When a tree goes horizontal, the top of the tree loses its ability to act as a growth regulator. Every bud along the trunk is free to make its bid for leader. The rapidly growing sprouts emerge in clusters that are ideal for capturing small bits of floating debris. If it can maintain life for a couple of years, the tree will make a formidable barrier. It’s clear to see that the tree is anchored firmly in place. The tree held its position against flood water strong enough to move those slabs of rock. 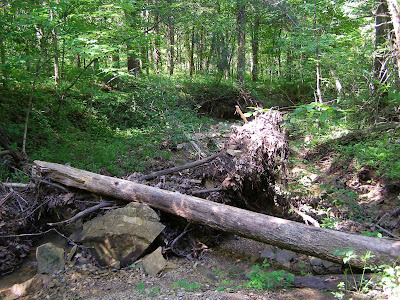 The tree not only stayed in place, it effectively kept the rocks from moving any farther downstream. If the tree could hold against the record flood, it should be able to easily maintain itself against the normal high water levels. This will be an interesting situation to watch. Diseased plants are normally a disturbing sight. 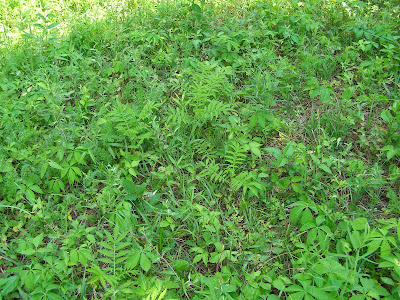 My initial reaction when I saw pale, shriveling plants in this jungle of greenery was dismay. That feeling dissipated quickly as I realized that all of the sickly plants were Japanese Honeysuckle. Anything that weakens an invasive plant species has got to be good. 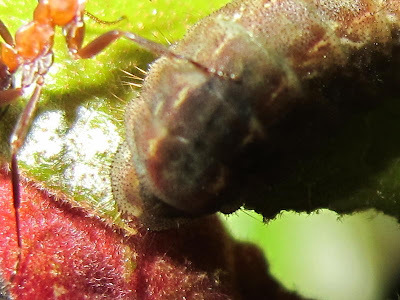 Closer examination revealed a velvety covering of mold on leaf and stem. The condition is commonly referred to as Powdery Mildew and is the result of a fungus growing on the surface of the plant. 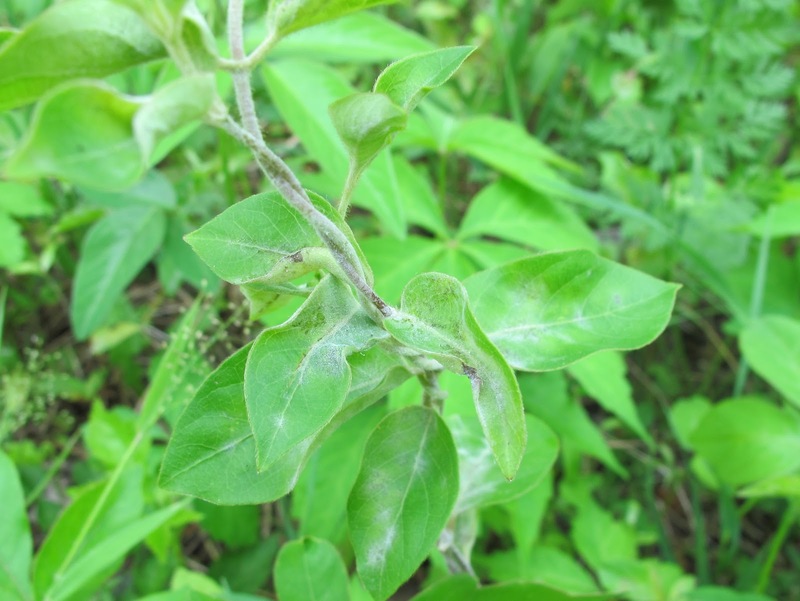 Powdery Mildew is an affliction shared by many species of plants, but for most plant species, there is a specific fungus that produces the condition. Spores produced by the fungus on the Japanese Honeysuckle will only grow if they happen to land on another honeysuckle vine. 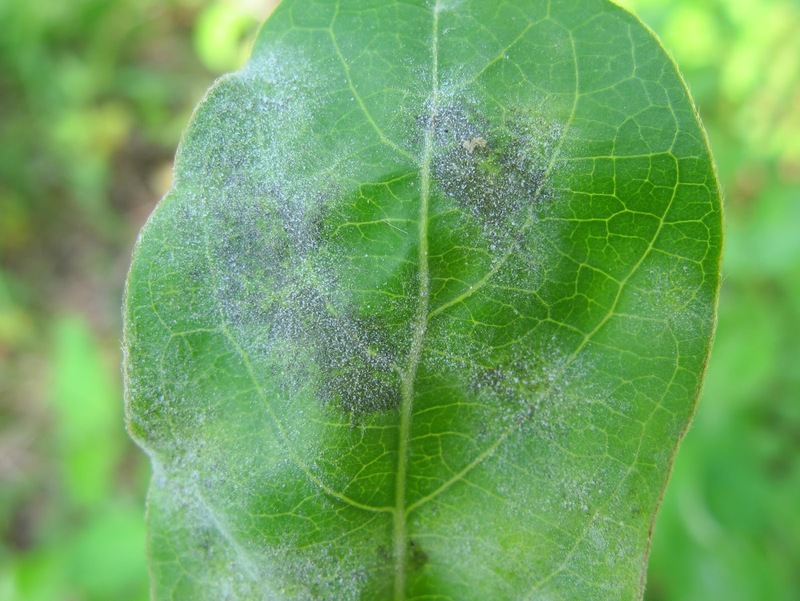 Powdery Mildew definitely weakens the plant and it can cause death in severe cases. 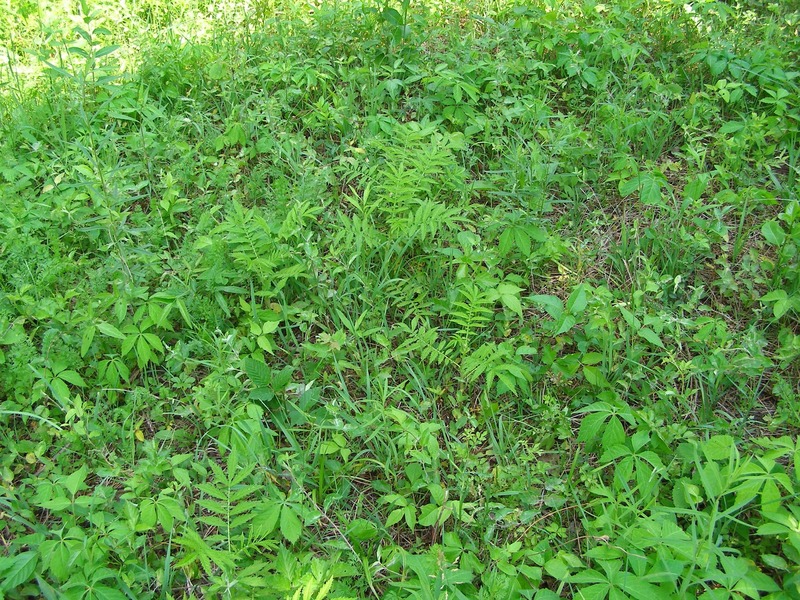 Shade, humidity and temperature are the three factors affecting the growth of the fungus. Spores ride the wind and blanket the countryside. I’m certain that all honeysuckle has been in contact with the spores. 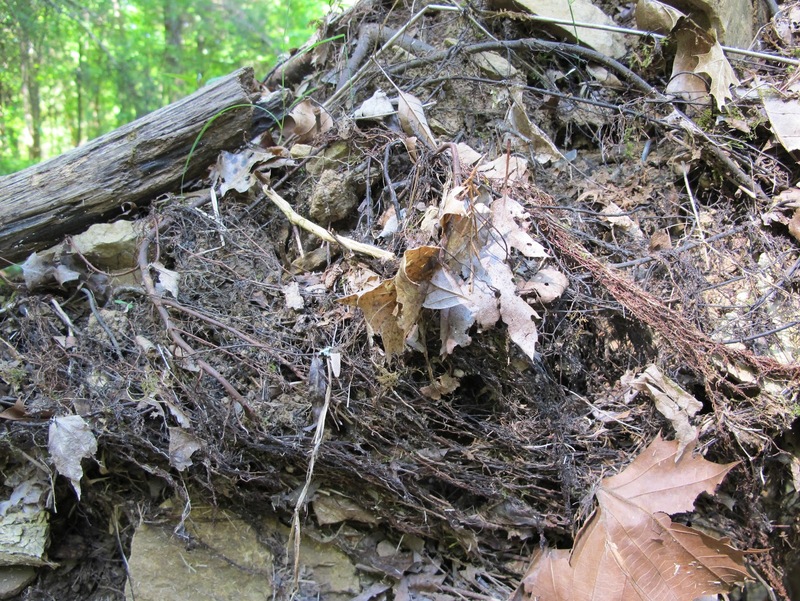 When conditions are favorable, the fungus thrives and the plants suffer. The fungus is only present in a few small patches of Japanese Honeysuckle at Blue Jay Barrens. The plants probably won’t die, but I’m hoping to see a significant reduction in competition between honeysuckle and the desired native plants. 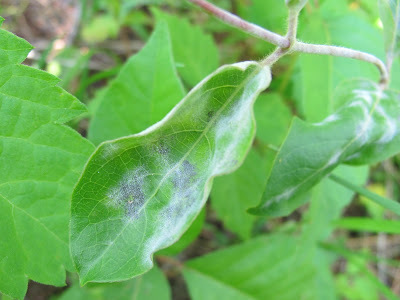 Powdery Mildew has long been known to people who cultivate Japanese Honeysuckle. Those people are happy to share methods of saving the plants, but I haven’t found any who have recommendations on how to encourage the fungus. I’ll be keeping a close eye on this honeysuckle area as the summer progresses. 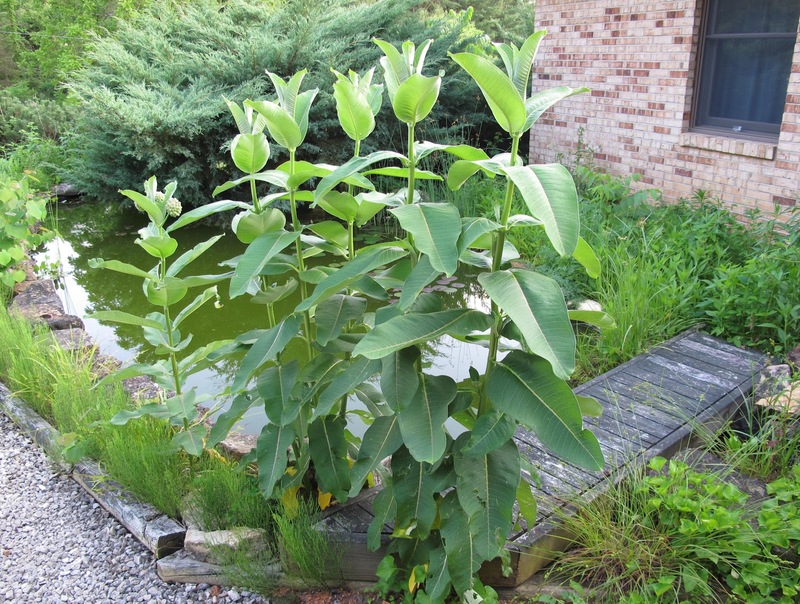 I would love to discover a method of growing the fungus on all of the Blue Jay Barrens honeysuckle. Since the fungus growth is more a function of weather conditions, there’s no way that I can control its spread. About the best I can hope for is the elimination of honeysuckle in these small areas. I’ll certainly keep hoping for the best. 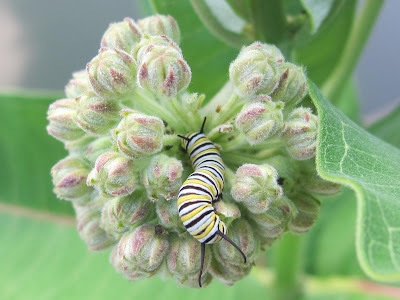 Judging by the numbers of larvae currently present, Monarch butterflies are going to be particularly abundant this summer. Strong southerly winds and warm temperatures brought this migratory butterfly to Blue Jay Barrens much earlier than normal. I’m looking forward to having this species as company through the summer. The Monarch butterfly was partly responsible for what people referred to as my poor attitude towards school. In our fifth grade science text, the developmental stages of a butterfly from egg to adult were exclusively portrayed by the Monarch butterfly. When the teacher distributed drawing paper and asked us to draw those stages, the entire class reproduced the illustration of the Monarch. Except for me. I chose to illustrate a Black Swallowtail, a species that I had raised on Wild Carrot during the summer. The teacher used the text illustrations to show how inaccurate my drawing was and explained that what I portrayed could not exist. I decided that if she could be that wrong about butterflies, she was probably just as wrong about everything else she was telling us, so I stopped listening to her. 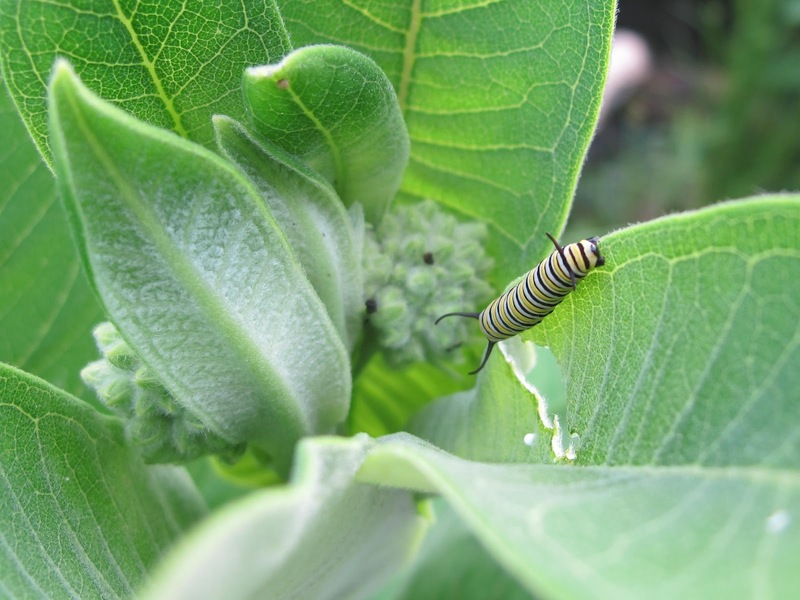 Monarch caterpillars feed on Milkweed leaves. A single Common Milkweed sprouted near the Water Garden a few years ago and has since developed into a nice clump. I see it every day, so it’s easy keep track of any changes. Fras accumulation on the leaves told me that there were caterpillars at work. Fras is also known as caterpillar poop. Caterpillars spend their lives taking in plant material and expelling waste. 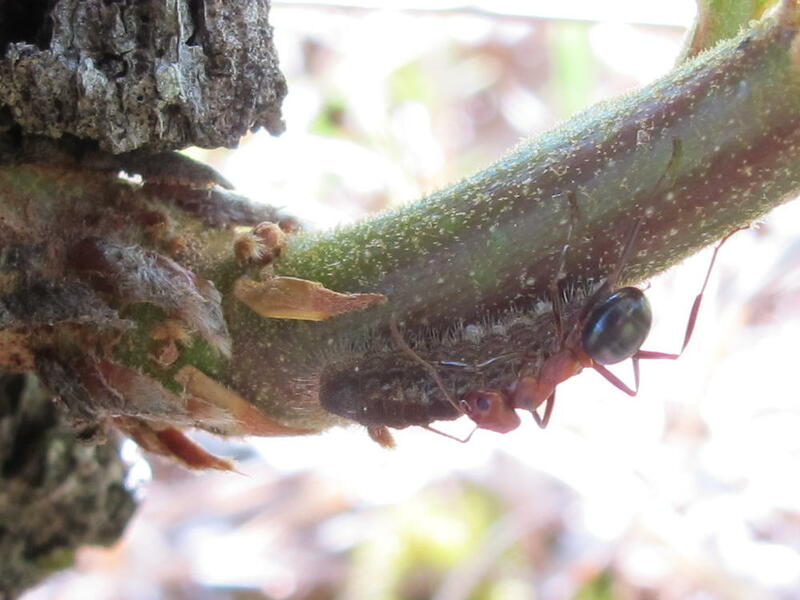 In a search for caterpillars, it’s often easier to find the fras and then trace that back to the animal. 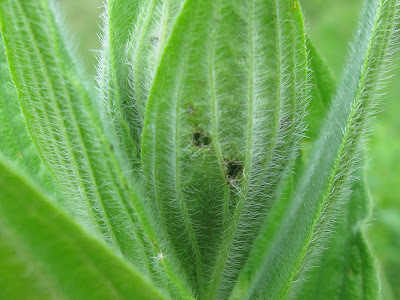 Loss of plant parts is another indicator of caterpillars at work. 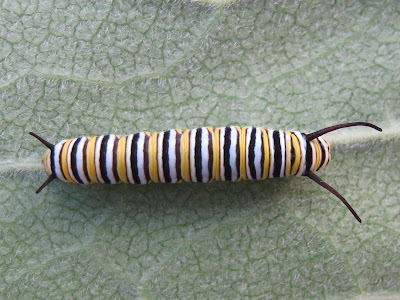 Newly hatched caterpillars often have trouble eating mature leaves. 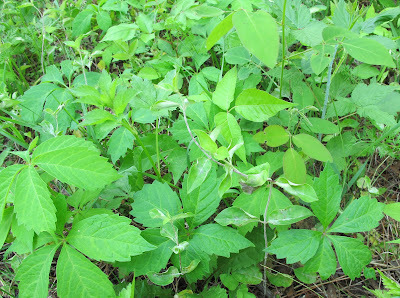 Newly formed leaves, like those found sprouting from the leaf base, are much easier to consume. A missing sprout is often caterpillar sign. 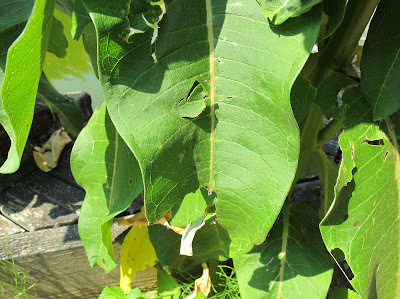 Holes or missing sections of leaf can also be the work of caterpillars. Just looking on the other side of the leaf reveals the culprit. The pattern of feeding is often a deliberate attempt to stop sap flow into the portion of leaf being consumed. 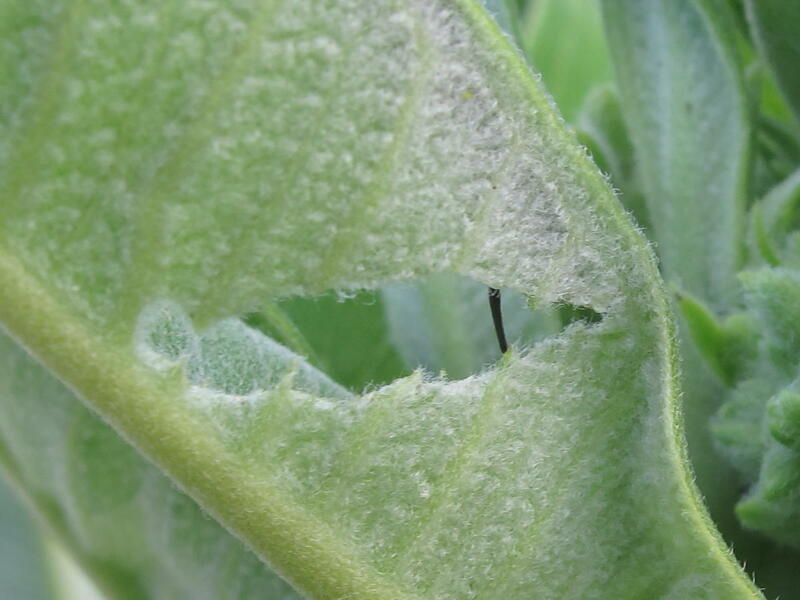 A damaged Milkweed leaf often releases the sticky sap. By isolating a section of leaf, the caterpillar can feed undisturbed by the sap. 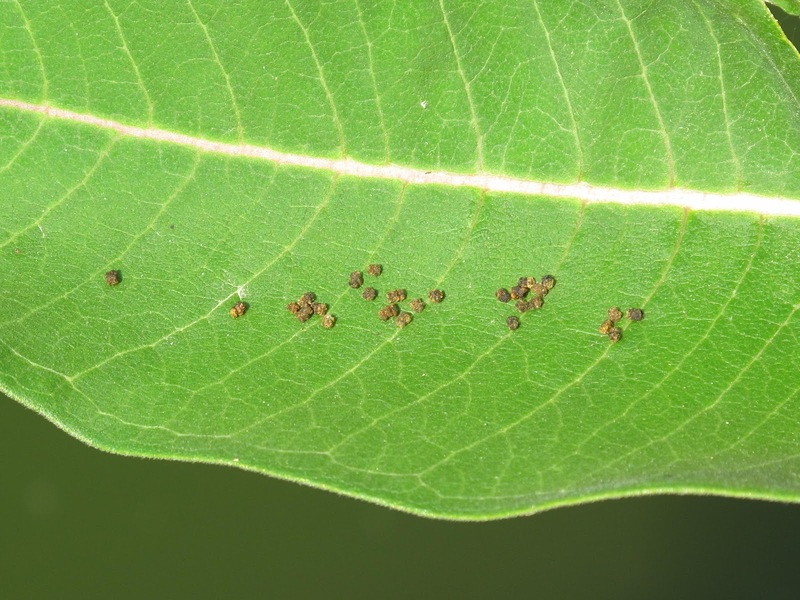 Not all holes in a leaf represent feeding damage. Jagged tears or holes, especially those with ragged bits of leaf remaining, are examples of physical damage. In this case, the leaves were battered by a hail storm. Flowers are also a choice target for smaller larvae. 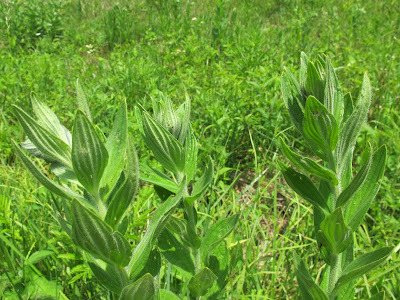 Some species of moths and butterflies actually lay their eggs on the flower buds. 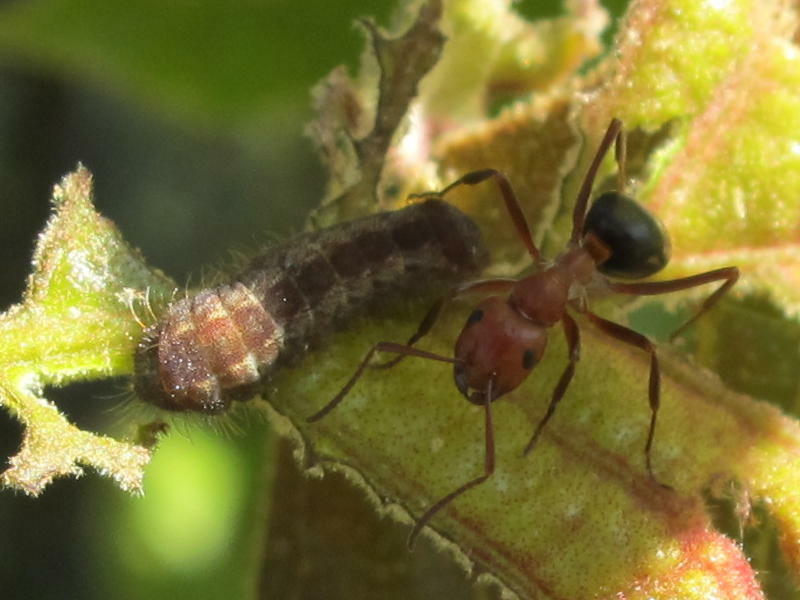 The young can begin feeding on more delicate parts before moving onto the tougher leaves. Many insects avoid detection by remaining on the under side of leaves, so always get your head down and look up. I watch many people examine a plant by staring at it as though it was a picture. Plants are three dimensional objects that require examination from various angles. Don’t forget that our bodies are supposed to twist and turn. Use that ability to avoid missing some of the wonderful things in nature. As I was walking to the barn, I heard the loud squeak of a shrew from a nearby area of tall grass. It’s not unusual to hear shrews in the grass, but you normally hear two instead of just a loner. I peered down into the grass to see if I could get a look at the shrew. Instead, I caught a glimpse of a Meadow Vole zipping through the grass with a vole baby in her mouth. 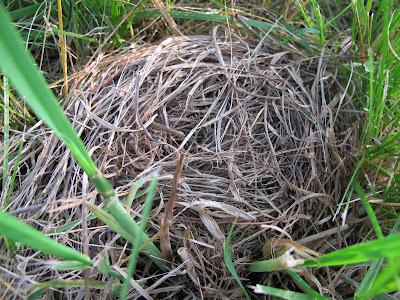 Then I found the rounded mound of grass that was her nest. 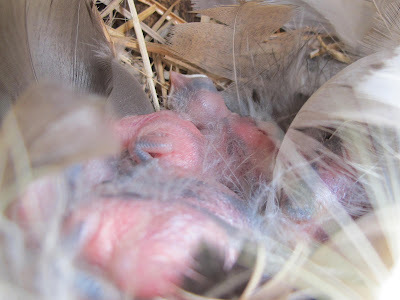 Inside the nest were five babies. I can’t prove it, but I believe the shrew found the nest and made off with one of the babies. 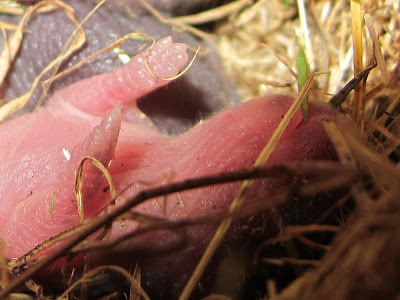 The squeak was probably the shrew’s reaction to a confrontation with Mama vole. The female vole’s response to a nest violation by a predator is to relocate the young to another nest. 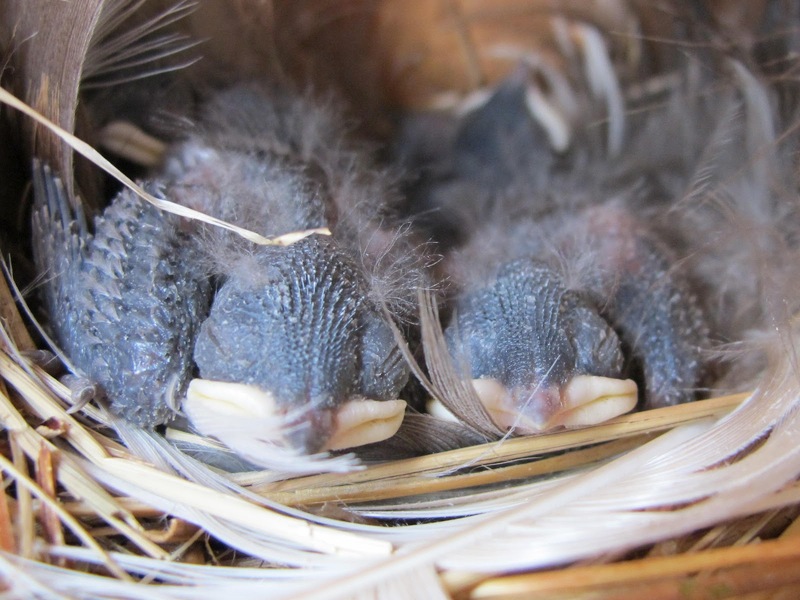 A normal litter contains six or seven young, so this nest probably began with seven. 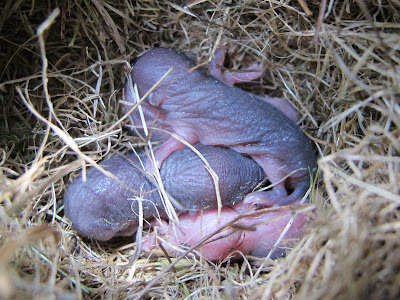 That’s one for the shrew, one carried off by the mother and five waiting their turn to relocate. This little guy will one day be a grass eater, but now it’s still dependent upon its mother’s milk. That’ll change rapidly. 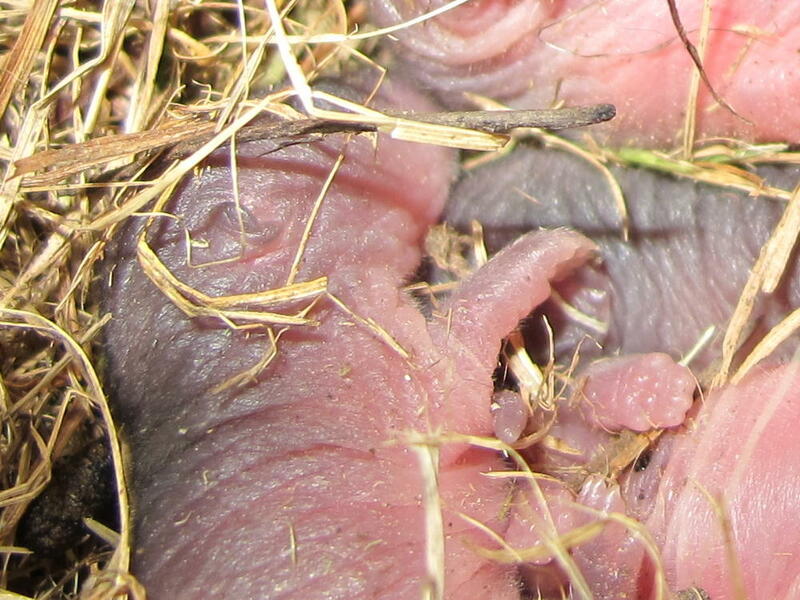 Meadow Voles are weaned when 12 days old. 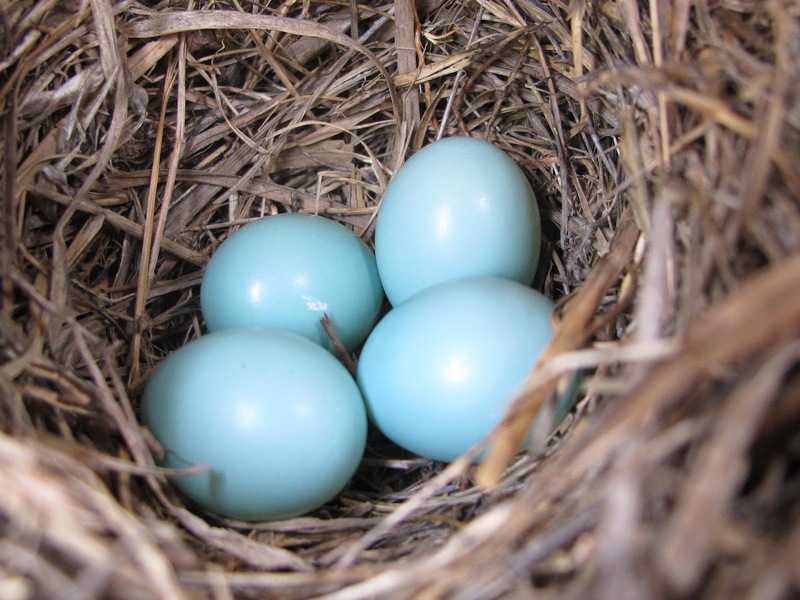 Females begin breeding at the age of 25 days. 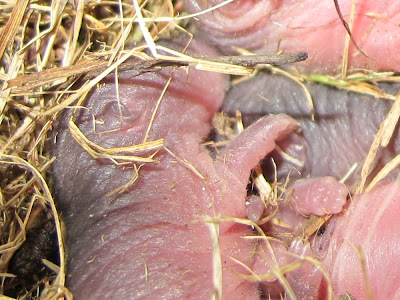 The mother vole mates immediately after giving birth, so her next litter is developing while she’s nursing the current brood. A gestation period of 21 days means that she can give birth about every three weeks. 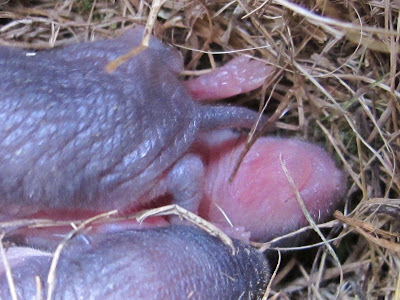 These young voles are destined to die in the teeth, claws, beak or belly of some predator. Voles are just active little packets of food. They are the primary food of a multitude of mammals, birds, reptiles and even fish. Meadow Vole breeding goes on year-round, so it’s fortunate that so many creatures find this animal appetizing. I covered the nest and went on my way. When I checked back a few hours later, the nest was empty. Litter relocation is a fairly rapid business, so I assume that these little guys are now off in a new nest. The Bluebirds and Tree Swallows have finally settled down and are busily raising families. 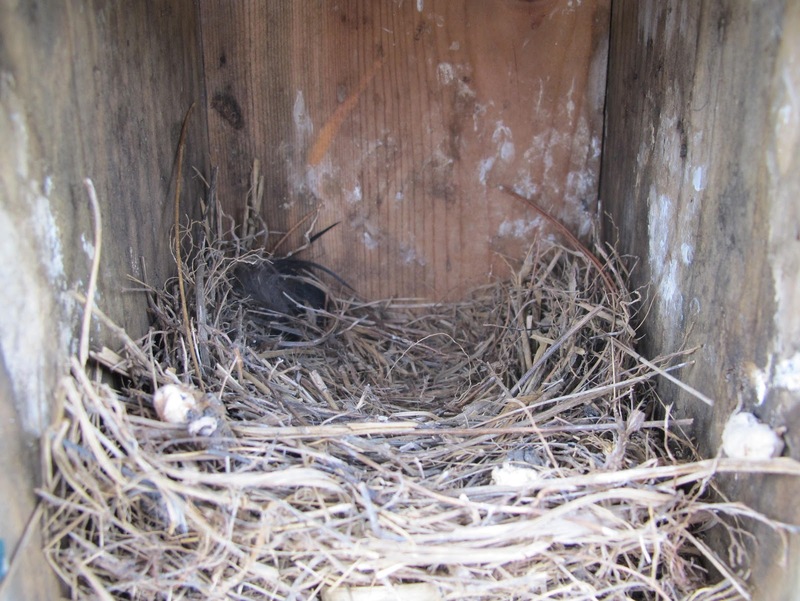 Earlier in the year there was constant squabbling over possession of nest boxes and establishment of territories. 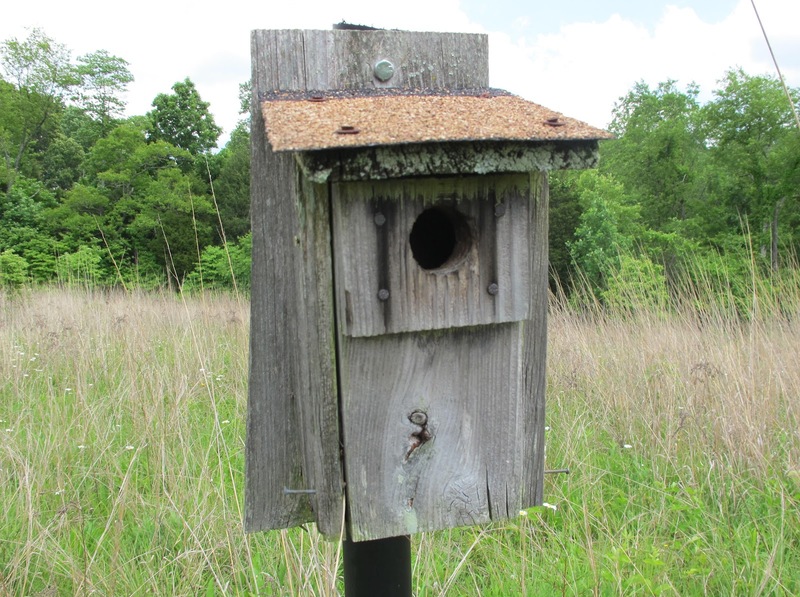 Now the field resembles a friendly suburban neighborhood with bird parents coming and going from their work of gathering food for growing broods. 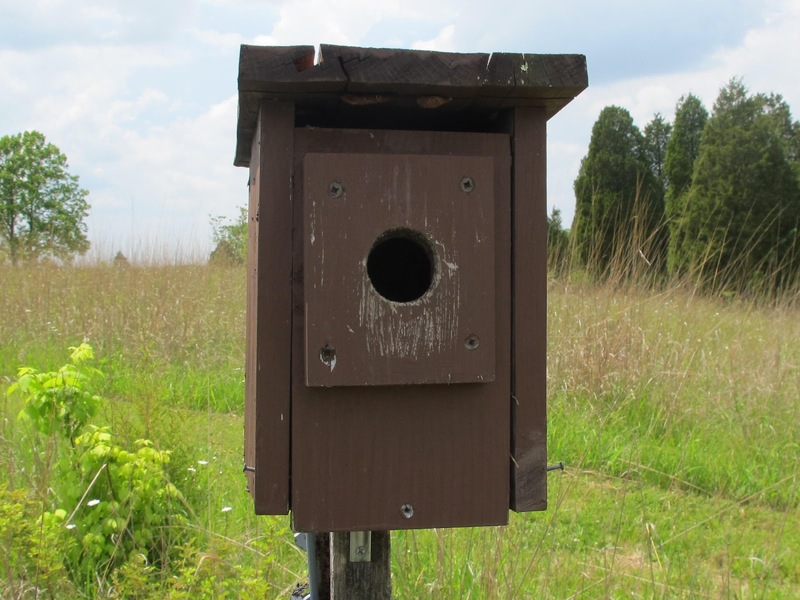 One brood of Bluebirds has already fledged from this box, and a second attempt is underway. 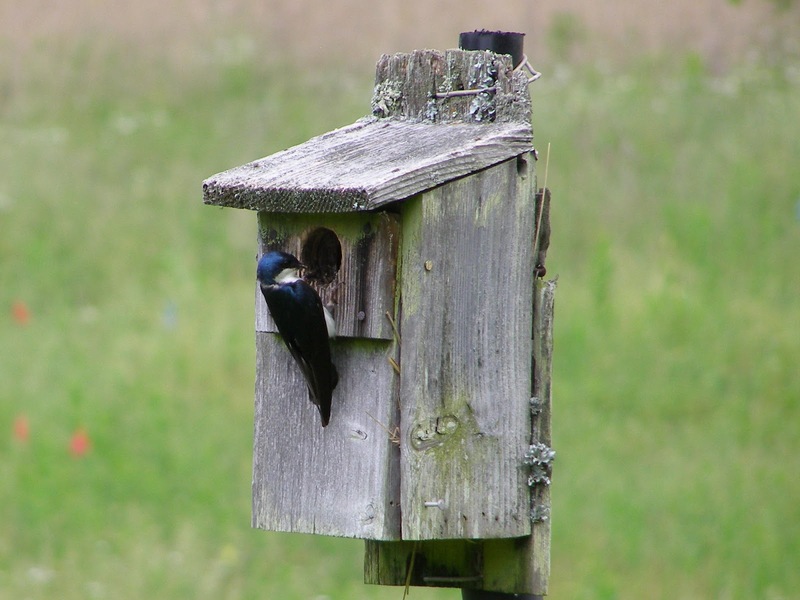 The normal sequence is to alternate Tree Swallows and Bluebirds in the boxes. That may be because the current occupant of the box drives away all others of the same species. When the box becomes available, it is more likely that a different species is on hand and ready to take advantage of the opportunity. I was surprised to find back-to-back Bluebirds this time. Another Bluebird brood had just left a box a little further along the trail. I went ahead and cleaned the old nest out to prepare for future nests. A new pair will go ahead and build over an old nest. Since there’s usually only a short span between fledging and beginning of a new nest, I don’t always get the old nest cleaned out in time and the nests begin to stack up. This is a more rural abode that sits well off the trail towards the center of the field. It has seen over 20 years of service and though it now sports some replacement parts, it’s heavily used every year. 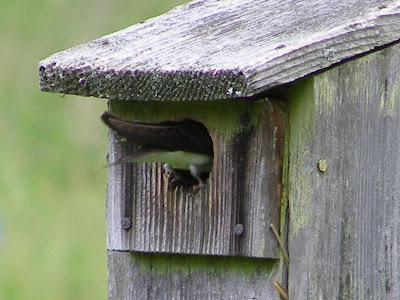 It is currently housing a family of young Tree Swallows. The next box down the line is also home to Tree Swallows. Swallows are currently outproducing Bluebirds by a margin of 2:1. I’ll probably have to put up a few new boxes this winter to accommodate the mob of birds that will arrive next spring. This is the oldest box in the field. It changed hands several times before a pair of Tree Swallows finally held on long enough to finish a nest and fill it with eggs. The young inside are very near to fledging. 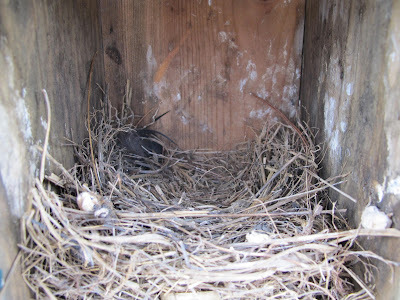 To avoid the possibility of prematurely flushing the youngsters out of the nest, I didn’t open the box for a picture. Warning: If you dislike stale, cliché, used to death conclusions; discontinue reading this post now. You’ve now reached the tail end of this story. There are certain caterpillars that I see each year, but by the time they become noticeable, they’re of a fairly large size. I’m making an effort to see some of these at their earliest stage of development, so I can get an idea of their life history. 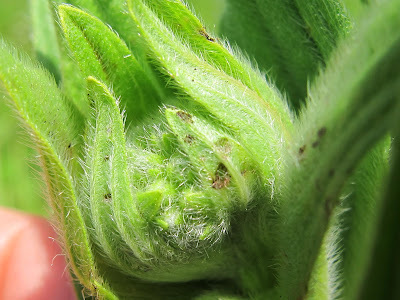 A good example is the caterpillar I find on the False Gromwell, Onosmodium molle var. hispidissimum, in late summer. I’ve never seen the earlier larval stages. I don’t even know its species. I just call it the Onosmodium moth. I have run into people who know this moth and they call it the "Oh yeah. I know that, but I can't think of the name." 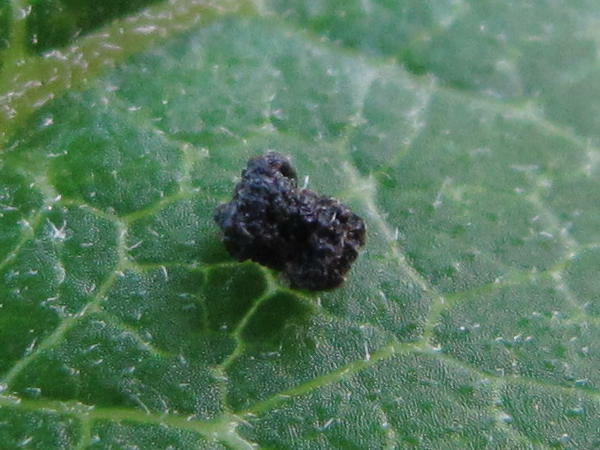 I’ve been watching the Onosmodium since it emerged and have recently noticed some signs of leaf feeding. The damage was concentrated in the area of new leaves at the top of the plant. 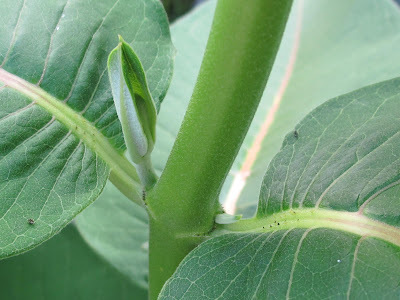 By folding back the developing leaves, I was able to trace the evidence of feeding right down to the emerging flower buds at the center of leaf formation. 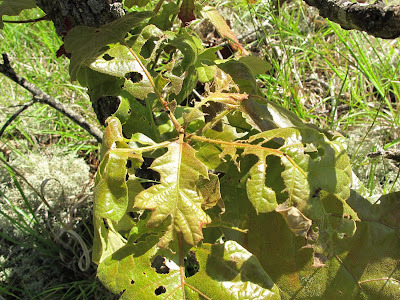 Damage on the old leaves matched that of the newer leaves, so the feeding probably happened when the leaves were young and closely wrapped. 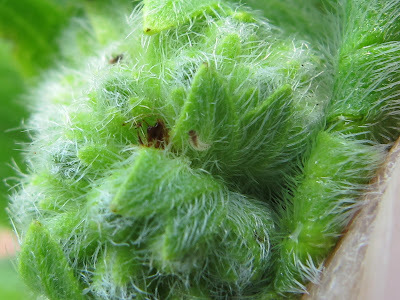 As I folded back the final leaf, I discovered this small larva at the heart of the new growth. This part of the plant will soon unfurl into a long stalk of flowers. 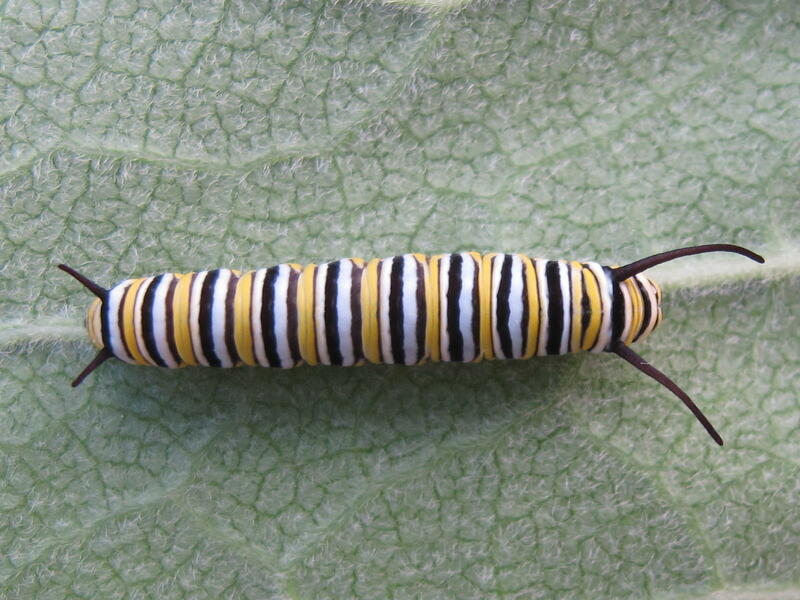 I’ve noticed in the past that the larvae begin feeding on the flower stalk and later move down to the stem leaves. I don’t know yet if this is the same species of larva that I’ve seen in the past. I’ll keep watching its progress. No matter what it is, I’m sure that I’ll learn something of interest through frequent observation. 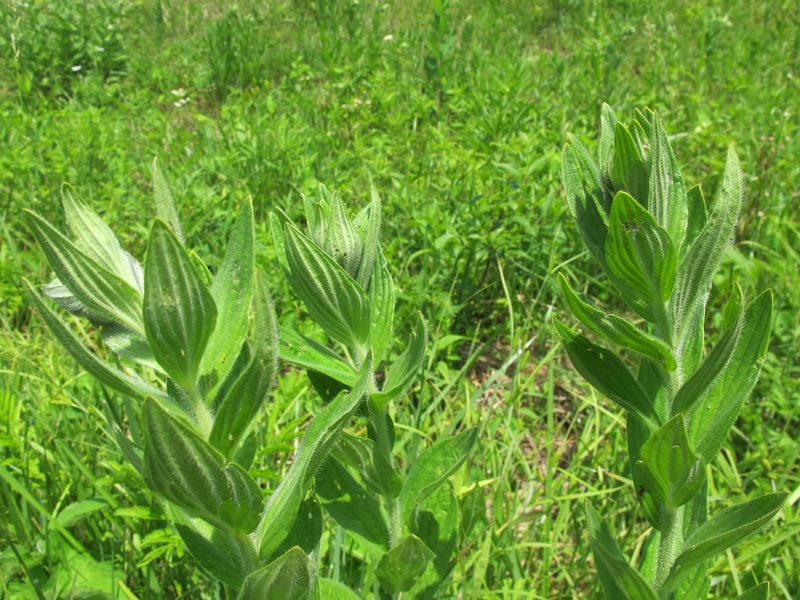 Onosmodium was an uncommon plant at Blue Jay Barrens when I began my management activities. 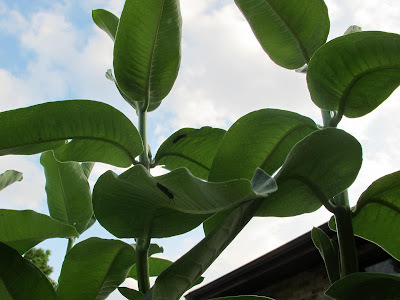 It forms a large seed that is easily stripped from the plant, so I began collecting the seed and scattering it around the immediate area of the plants. 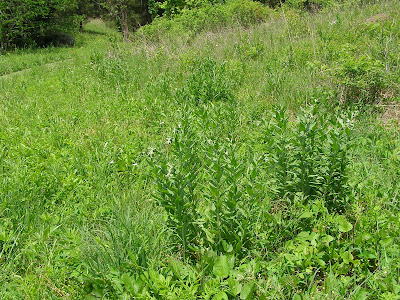 Areas along trails got the most attention and this Onosmodium patch near the trail head has grown from a few plants to several hundred. There’s plenty of food here for the Onosmodium moth. At a certain stage in the development of an Edwards’ Hairstreak Butterfly larva, it will begin feeding at night and hiding at the base of the tree during daylight hours. I’m trying hard to witness this daily migration of the larvae up and down the tree. On a recent early morning visit to a small oak hosting a family of caterpillars, I was lucky enough to find a larva that was still actively feeding. 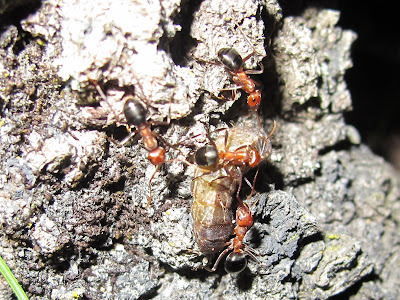 Allegheny Mound Ants normally keep close company to the larvae. 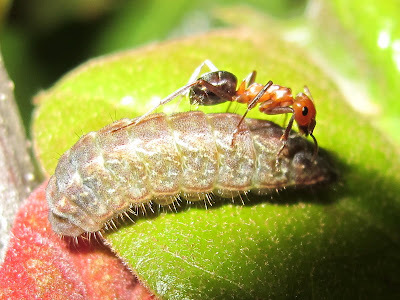 The larva receives protection from the ant and the ant is rewarded with a bit of sweet honeydew secreted by the larva. The ant may patrol the near vicinity, but it is seldom more than an ant length from the larva. When the early morning sunlight illuminated the larva, it left the leaf and began its journey down the tree. 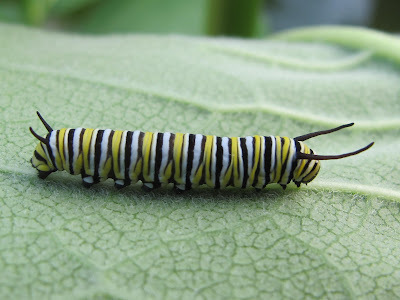 From the reading I have done, I thought the larva would move at a slow pace. I was surprised at the rapid pace at which the larva actually traveled. It wasn’t nearly as quick as an ant, but it made a respectable retreat down the stem. 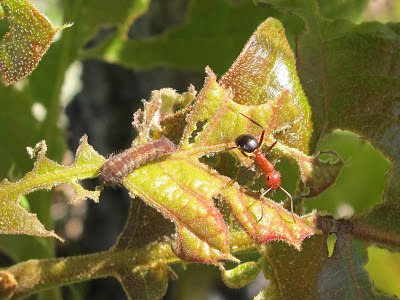 I also thought that the ant would give more direction to the larva. 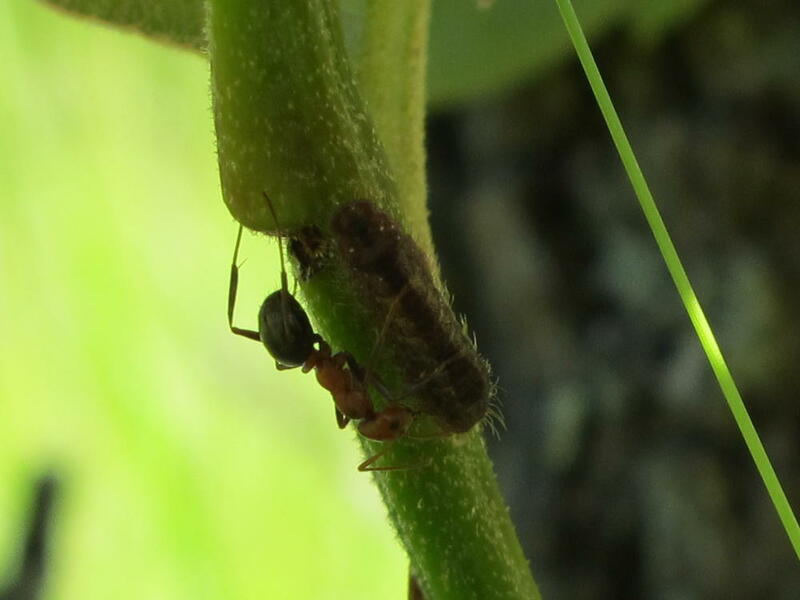 The behavior of the ant suggested that it was just following along in an attempt to keep with its source of food. There’s got to be more to the association than just a bit of food, because the larva only produces honeydew during the final stages of its development, but the ant protects it from the time the larva hatches from the egg until the winged adult butterfly emerges from the pupa. The larva didn’t slow upon reaching the trunk. The downward trek continued at a constant pace. When it emerged into a band of sunlight, it stopped. Its reaction was like that of a typical movie vampire. At the first touch of sunlight, it quickly reversed course. It finally tucked itself into a protected area of the tree bark and stopped. It appeared to be settling in for a long stay, so I didn’t stick around to see if it resumed its journey when the shade finally covered the rest of the tree trunk. 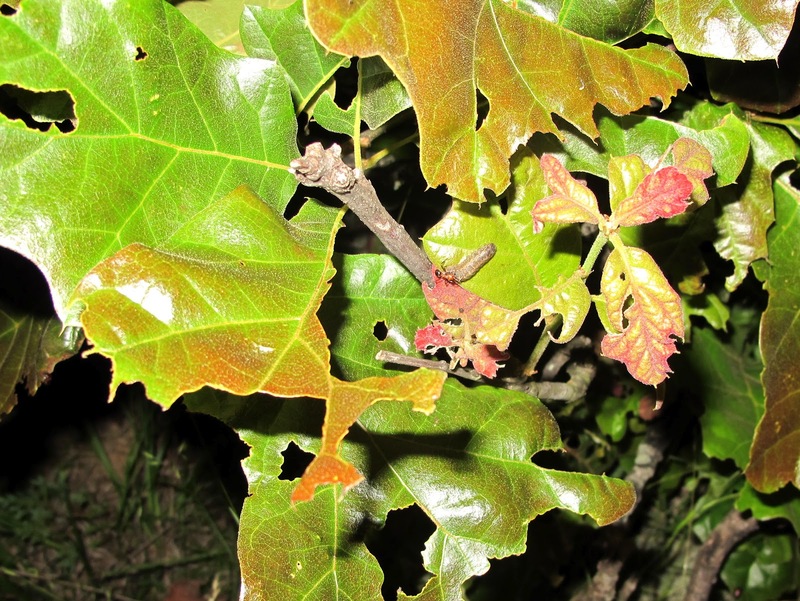 There’s evidence of feeding on many of the oaks. I hope this year to witness the night time feeding and the mass migration of larvae heading down the tree towards daytime shelter. Note: Piece together the whole story by clicking on Edwards’ Hairstreak in the list of labels.